Our Sermon today is on the need for you to pray for the country the Lord has placed you in. The country you judge by what you are told by politicians and not what you experience and share with your fellow citizens of all ethnic backgrounds without any prompting from ethnic-driven politicians. Do Kenyans love their country? Do Kenyans love fellow citizens? Do Kenya politicians care about their Country? Do they care about fellow citizens? Answers to those questions depends on who is asking which community and at what the prevailing political climate is. In general Kenyans value the freedoms handed down since independence in 1963. We enjoy its prosperity. We take our hates off to our heroes every Mashujaa Day. We respect the flag. We sing the National Anthem. We do not live in a fools paradise as the political class would like it but many are captives of our ethnic hate. Is it any surprise if at times we feel like bipolar citizens at times swinging from the heights of patriotism to the depths of ethnic hopeless future, morally bankrupt? In my youth our homestead was transformed into a huge Mau Mau emergency concentration village in Manyatta, Embu, by the British colonialists and life was never the same again. What can we learn from the Lord’s prophet, Jeremiah, for today? No doubt, his fellow countrymen in exile to whom the Lord had him write this letter felt torn between opposite poles as well. It was about 600 B.C. according to current calendar. Zedekiah reigned in Jerusalem. But the power was with Nebuchadnezzar, king of Babylon. Zedekiah was only his vassal (a dependent landholder in feudal society that politicians create to domineer their communities alias subjects – like the British Monarchy and colonial governors in Kenya from 1920-1963). In fact, Nebuchadnezzar had taken Zedekiah’s predecessor, Jehoichin, into exile along with many of Judah’s officials, leaders, and craftsmen. Jeremiah was writing to them in exile. Imagine how they must have felt, taken from their homes, their native land. Remember this is before Jesus’ birth. The Lord’s promise tied the hope for the coming Saviour to the land of Canaan and David’s family line. Jerusalem was still the one place the Lord had chosen for his temple. All that would change after Christ came, but put yourself into the mindset before Christ (B. C.). Can you feel the hurt, anger, and despair these exiles must have felt? Do you see how tempting it was for them to pray for the downfall of the place they were exiled to? Do you feel the anguish of 2008 mass action ethnic cleansing that created over 65,000 families (3,4 million) internally displaced Kenyans? But what does Lord say to them through the prophet Jeremiah? “Seek the peace and prosperity of the city to which I have carried you into exile. Pray to the LORD for it, because if it prospers, you too will prosper” (Jeremiah 29:7 NIV1984). They would be there for seventy years. For most of them that would be the rest of their lives. They were to settle down and make their homes there. The Lord would bless them as he blessed the place they now lived in. But they still knew that their true home was back in Jerusalem where the Lord had placed his name until Christ came. If we can keep ourselves in the mindset of these exiles, we will know what it means to pray for the country the Lord has placed us in. That’s the theme for us to put into practice as the Holy Spirit fills our hearts through God’s Word today. Pray for the country the Lord has placed you in. a) For he wants to bless you through your country, and b) He has an eternal future planned for you. 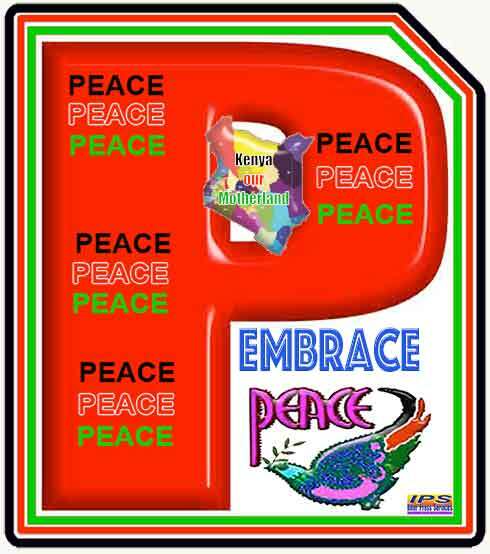 Kenya hosts hundreds of thousands of exiles (popularly known as refugees) who pray for peace in their countries every day in vain over the years. Pray for the country the Lord has placed you in, just as those exiles were to pray for the city they were living in. They were to pray for it not because their city was so good or so much better than other places. It wasn’t. They were to pray for it not because they felt so patriotic or felt that their city merited God’s special favour. That wasn’t so. They were to pray for it because that’s where the Lord God had placed them. And he wanted to bless them by blessing the place they were living in, blessing it with peace and prosperity. So like those exiles, we also pray for our city, county, and country where God has placed us. We pray, not because we think this is the best place in the world or the greatest country on earth. We don’t pray with arrogant patriotism that thinks we’re better than other nations or that we’re a more “Christian” nation. Those thoughts may make us feel very patriotic, but that’s a dangerous kind of patriotism. Don’t be fooled by the rhetoric. Rather pray for your country, your county, your city because this is where God has placed you, and he wants to bless you by blessing the place you live in. Yes, pray giving thanks to God for the many freedoms, opportunities, good things he has given our country and communities. But also pray recognizing the many failures and faults we share as well. Yes, love your country and pray for it because this is where God has placed you. That’s a balanced patriotism that keeps God above country, knowing that whatever goodness we see in our city, County, or country comes only because of His gracious blessing. So we pray for his blessing to continue. So much of our own earthly prosperity and well-being depends on God blessing us with wise leaders, orderly government, just laws, and peaceful relations. Yes, God certainly wants us to work as we are able and to provide for our families. We are not to indulge in laziness expecting the government to take care of us. But what good would a hard-day’s labour do if the government did not enforce law and order around us and provide the economic framework so that a shilling we earn actually has some sort of value? That’s how God uses government to bless us. Christian, pray for the country the Lord has placed you in because he wants to bless you through it. Don’t pray with that selfish attitude that wants peace and prosperity so that we can live it up or take it easy. Rather, remember what the Apostle Paul writes to young pastor Timothy, “I urge, then, first of all, that requests, prayers, intercession and thanksgiving be made for everyone … for kings and all those in authority, that we may live peaceful and quiet lives in all godliness and holiness. This is good, and please God our Saviour, who wants all … to be saved and to come to a knowledge of the truth” (1 Timothy 2:1-4 NIV1984). Listen not to the politicians eager to mislead you with promises of a better life they could not provide when they had the opportunity in past government. As God blesses you through our country, live peaceful and quiet lives. For you know the peace that Jesus brought to you when he reconciled you to God through his death for your sins. As God blesses you through our country, live in all Godliness and holiness. For you have been washed clean and reborn into his family through Baptism. Do not blemish your life with temptations of witchcraft and idol worship driven by ethnic political greed. As God blesses you through your country, remember that he wants all to be saved by coming to the knowledge of the Truth. Remember Truth shall set you free. He gives us earthly wealth so that we can spread his truth, generously supporting his work – not to buy the grandeur of political power for the sake of power. And as his Word is correctly taught, the Holy Spirit works saving faith in the hearts of others. Do you see why the Lord wants to bless you through your country? Pray for the country the Lord has placed you in. For he has an eternal future planned for you, your children and future generations. But as you pray, dear brothers and sisters in Christ, remember your true home. It’s not Kisumu, Nairobi, Mombasa or whatever other city you may have been born in or grew up in. Your native land is not Kenya. We are foreigners, strangers and visitors here on this earth. For when you were reborn through the water and word of Baptism, you became a citizen of the heavenly kingdom. Your King and Lord is the one who redeemed you with his blood to be his very own people. He has an eternal future planned for you who believe, a future where hope becomes reality. Those exiles knew that even as they prayed for the well-being of the city they were living in, their home was back in Judah, the promised land where the Saviour would be born. To strengthen that hope Jeremiah reminds them of the Lord’s promise. After seventy years he would bring them back. Yet before that happened, Jerusalem itself and the temple would be destroyed. They dare not believe the false prophets that promised a speedy return. They dare not build their hope on political solutions of false promises of a quick journey to Canaan. But the Lord would not forget his promise, no matter how far off or impossible it seemed. He would come and take action. He had it planned out. “‘For I know the plans I have for you,’ declares the LORD, ‘plans to prosper you and not to harm you, plans to give you hope and a future” (Jeremiah 29:11 NIV1984). Now the Lord has not revealed specific earthly plans for us as he did for his people in exile. But after our pilgrimage of seventy years or so on this earth, what a future he has planned for you who believe! He will take us to the heavenly Jerusalem, which needs no temple. For Lord God himself and the Lamb are its temple. Remember what the Apostle Peter wrote about this hope and future: “Praise be to the God and Father of our Lord Jesus Christ! In his great mercy he has given us new birth into a living hope through the resurrection of Jesus Christ from the dead, and into an inheritance that can never perish, spoil or fade, kept in heaven for you, who through faith are shielded by God’s power” (1 Peter 3:5 NIV1984). Until that time, the Lord certainly plans to take care of you. He’s promised it, for he is your dear heavenly Father. Through faith in Jesus you are shielded by his power. No matter what this earthly future brings, no matter what happens to our country and its moral decay, no matter where the political winds blow or what budget is passed or not passed, the Lord’s plans for you now and forever will not fail. With that confidence in his word of promise, seek the Lord throughout your life and call on him in prayer. The Lord says through the prophet: “‘Then you will call upon me and come and pray to me, and I will listen to you. You will seek me and find me when you seek me with all your heart. I will be found by you,’ declares the LORD” (Jeremiah 29:13 NIV1984). Yes, seek him, dear Christian, with all your heart. Seek him in his Word and Sacraments, for that is where he has chosen and promised to be found. As his word fills your heart and mind, know that he hears your prayers. So pray for your country. Pray that the word of our God touches the hearts of our fellow citizens. For the righteousness of the people uplifts a nation. Pray that the Lord stop the moral decay that hardens minds against his will. Pray, trusting his good promise and faithful plan that has heaven as your hope and your future. Pray for the country the Lord has placed you in. As he blesses our country with peace and prosperity, use what he gives you to bring the knowledge of the truth to others, so that they too believe and are saved. Pray confident that he ahs an eternal future planned for you, his faithful people. Then the bipolar extremes of patriotic mania and political despair won’t swing you around. For you know that your heavenly Father is taking care of you and that all things are in the hands of you Lord, who has redeemed you. His promises and plans will not fail, Heaven is your native land, heaven is our home. Amen. The Peace that God gives surpasses all understanding by human beings. Keep your hearts and minds in Christ Jesus. Amen.